IB Public Bank has on this morning issued a buy call on lost making one-time-use plastic manufacturer SCGM. This immediately caught the attention of everyone in the investing community. The same IB which caused a stir with its much publicised sell-call on Dayang is indeed making a fool of themselves. SCGM went against the market when it invested heavily in the so-called Industry 4.0 for ramping up its production. The current machine utilisation rate is below 50%. Its borrowing and depreciation cost are blowing above the rooftop. The demand of one-time use plastic is shrinking, Government already said the one-time use plastic will be banned in 2020, there is virtually no entry barrier for this type of industry, because of this, the competition is very fierce thinning its profit margin in the process. YET, IB PUBLIC BANK IS ISSUING A BUY CALL FOR SCGM (TP 1.39, UPSIDE 30%). 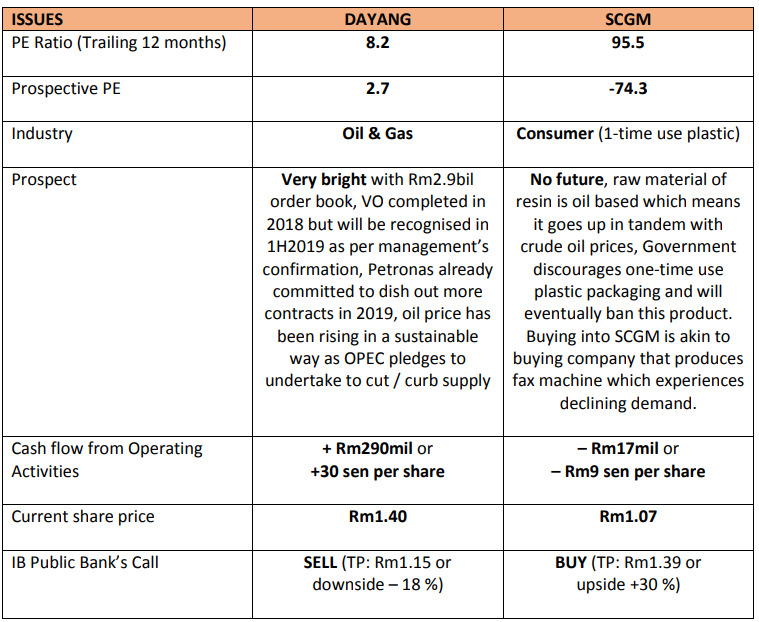 Below are IB Public Bank's takes on Dayang vs SCGM. Stop being them (the IBs) and be yourself and don't follow the calls set by the IB. If you like going a certain way, then be bold and do it. Only the bold and patience will win big in Dayang.